Above: 26, 27.5 (650b), and 29" wheels. Which one is right for you? In the beginning there was one mountain bike wheel size, 26 inch. In the late 1990's the 29 inch wheel was introduced. It promised to be faster, smoother, more efficient. One thing it did do is start a debate about what is the best wheel size for the mountain bike. Over the last couple years there has been another wheel size introduced and in 2013 this will renew the debate over what is the best wheel size. This ‘new' size is 27.5 inches in diameter and uses a 650b rim (you will hear both names depending on who you are talking to). This places it smack dab in the middle of the two current wheel sizes, with many mountain bike pundits pronouncing it to be the best of both worlds. Can it really be true? Will this finally silence the mountain bike wheel debates? Let's look at the differences between the wheels and the type of bikes they are designed for. If you are not familiar with the wheel wars, they began in the 1990's with the development of the 29 inch wheels. The designers found that the larger 29 inch wheels had some advantages. The bigger wheel was more stable. Because the contact patch is bigger there is more traction. And the larger diameter helped them roll over obstacles better. There were drawbacks, however, including components that were heavy and not too plentiful, bikes that didn't fit everyone or ride in a manner we were accustomed to. Almost 20 years later that has all changed. The wheel that was once questionable has won national, world cup, and world championship cross country and endurance events by riders both tall and small. High quality, lightweight components are widely available. The bikes have evolved to suit all types of riding; hardtails and short travel full-suspension for racing, 100-120mm full-suspension for cross-country, and 130-140mm full-suspension for all-mountain riding. In fact, it seems like the 29 inch wheel should be perfect for mountain biking with its inherent stability and roll-over-everything properties. Still, there are some drawbacks to the 29er (depending on who you talk to) such as fitting x-small riders, wheel acceleration and agile, quick direction changes (i.e. twisty single-track). Even as a growing number of riders are now using 29ers, 26ers still rule. They've been around so long it would seem that every part has been perfected, and they still find ways to improve. A 26 inch bike can be constructed for any size rider and for any type of riding. For example, it is easy to have an ultra-light full-suspension bike for a person under 5 feet tall. On the other end of the spectrum, there are bikes with enough travel to jump off a two story house. And there is everything in between. Now there is a new wheel size, 27.5. Based on an old French touring rim size, 650b, its diameter is between 26 and 29 inch. Logic would suggest it has the best of best of both worlds. With its larger diameter, it is more stable, has more traction, and improved roll-over capability than a 26 inch wheel. Being smaller than 29 inches in diameter makes it lighter, quicker, and more maneuverable. Already there are many component choices available. Comparing the limited (but high quality) selection of wheels, tires, and bikes available, I found that the 27.5 components do weigh in the middle between 26ers and 29ers. Of particular importance though, I did find that the weight difference of some identical wheelsets and tires (same models, different size) between 29 and 27.5 was 2-3 times more than the difference between 27.5 and 26. In terms of bicycles, I found two brands that manufacture similar bikes across the board for all sizes. Among these brands the weights were equal amounts different than each other per wheel size. Wheelbase, a significant design parameter, also differed equally per wheel size. So what does all this mean? It means that 27.5 appears to be here to stay. Several bike and component manufacturers are on board with bikes for the the long travel all-mountain enduro market. With 150mm of full-suspension, these are bikes that are as capable on a 30-40 mile cross-country ride as they are at the bike park. But don't count the other sizes out yet. The 29er has finally reached the mainstream and will remain a major player for everything from lightweight racing to mid-travel all mountain. The 26er is still the standard that by which all mountain bikes will be judged be it ultra-lightweight racing or downhill bikes. The bottom line is that with so many choices available, consumers will need to narrow down what they want in a bike (if they expect to have only one) and then test them out to find what's perfect for them. 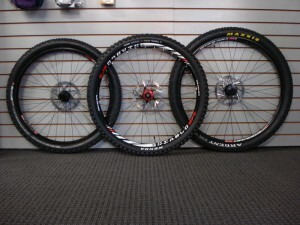 One Response to "Which Wheel is the Right Size for Mountain Biking?" Greetings from South African Mountain bikers;thanks for a great site.